We have examined that Consciousness-Force or Chit-Shakti builds the worlds and gives meaning and purpose to existence. This is a very high spiritual realization that has been elaborated by metaphysical psychology and is beyond our usual sensory perception. Yet the world as we know appears concrete and tangible because it is perceptible through our senses. The question is – How does the Chit-Shakti of spiritual realization become the tangible matter measurable through our senses? The transition from the metaphysical basis of psychology to the physiological basis of psychology is best illustrated by studying how the conceptual perceptions of sensory reality emerged in the Indian tradition. This is beautifully elaborated in the process that describes how the different levels of our world were built. We shall start to study in brief this process by first examining how we are all aware of forms of matter. It has been traditionally experienced and conceptualized in Indian metaphysics that matter is built up from five subtle elements that follow each other in successive stages. There is an experiential point where the subtle, ethereal matrix of matter precipitates into concretely perceptible material forms signifying the transition between the metaphysical and physiological paradigms of psychology. It is difficult to conceive of the pre-material stage of the universe. Presumably, there was the vast ocean of Inconscience, —an ethereal expanse that was silent, immobile, formless, fathomless. This primal ethereal state was disturbed by the influx, the penetration of a material energy—elementary, mechanical but nevertheless‘energy’. The very act of penetration implies a Movement—a disturbance of the primal, immobile status of ether. This disturbance produces ripples or vibrations in the bosom of the primal ether. As vibrations produce sound, this stage is symbolized as the sound element in creation. Indeed, ‘movement’ is the primal beginning of the creative process that has to be initiated from the poise of slumber that is characteristic of the Inconscience. That is why Sri Aurobindo uses the term ‘formative movement’. In Savitri, He poetically describes how the cycle of creation is initiated by the stirrings of an initial movement in the bosom of the inconscience or primal ether .The primal ether is described as ‘a fathomless zero’, ‘ a soulless void’, ‘a formless stupor’, an ‘unbodied infinite’. Thus is born the concept of ‘CONTACT’ of forces. 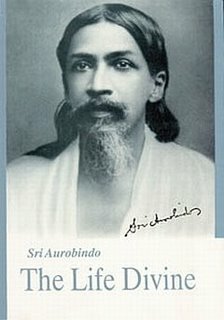 Sri Aurobindo describes that ‘contact’ is the basis of all material relations. Why? It is contact of subatomic particles that constitute an atom; it is contact of atoms that construct molecules; and it is contact of molecules in various permutations and combinations that is the basis of diverse forms of matter. In the old Indian system, the phenomenon of ‘contact’ is a characteristic of the material Force when it shifts from the ethereal to a status symbolized as ‘aerial’—the second element in creation. Air denotes universalization and this is what is projected by contact of Forces—hence the symbol. Neither vibratory movements nor contact of forces are sufficient to produce material forms. There is needed a sustaining principle that dynamises and shapes the movement of energy inherent in the hitherto unshaped forces playing with each other. ‘This is provided by a third self-modification of the primitive Force of which the principle of light, electricity, fire and heat is for us the characteristic manifestation’ (Ibid, pg 90). This is a goal-oriented energy-mechanism that is represented in terms of ‘nuclear energy’ at the material level and ‘metabolism’ at the cellular level. As a result, the forces that were unshaped come to acquire shapes i.e. they become invested with meaning, purpose and uniqueness. This dynamisation of forces is a prerequisite for the condensation of forces as forms and is metaphysically symbolized as the Agni or fire-element in creation. Yet it is insufficient to produce tangible material forms. Mere dynamisation and shaping of forces in the ocean of material energy remain incomplete to produce material forms. The dynamic forces cannot be at isolation from one another. They need to intermix and coalesce with each other to form new integers and mutations. If this capacity were not developed, we would not have a ‘variety’ of forms. This diffusion and intermixing of material forces need a medium. Ideally this medium should permit ‘permanent attractions and repulsions’ (Ibid), -- “permanent’ as this is to be the precursor of ‘consistent’ forms or else the world of forms would be chaotic, unstable and disorganized. This medium is symbolically and picturesquely described as the water element in creation. The phenomenon of diffusion of Forces must be supplemented by a phenomenon of ‘cohesion’, ‘solidification’ and ‘concretization’ so that tangible and measurable material forms are finally precipitated. The transition from the metaphysical basis of psychology to the physiological basis of psychology is finally represented at this stage that is symbolized as the earth element in creation. BY THE FOURTH ELEMENT THE SENSE OF TASTE; BY THE FIFTH THE SENSE OF SMELL. The metaphysical perspective detailed above still falls short of explaining the phenomenon of CONSCIOUS SENSATIONS. It explains the workings of the energy aspect of Chit-Shakti (Consciousness-Force), but has still to bring in the Chit or consciousness aspect of Chit-Shakti in creation. Actually, we were so long focusing on the emergence of tangible material forms that was a resultant of the influx of the elementary material energy in the primal ether of Inconscience. In the next stage, the material forms have to be the basis of living forms. How is that accomplished? For this to occur, matter must be animated by the influx of consciousness. This means the infusion of a non-material life-energy in the matrix of inanimate matter. It is achieved by ‘a vast cosmic principle of Force’ (Ibid) at work that is named MAHAT in ancient terminology. But the very influx of life-energy as a ‘movement’ in the bosom of matter simultaneously implicated the possibility of ‘depletion of energy’, of ‘entropy’, of ‘death’. Thus there is introduced a principle of division, a principle of limitation. It is this divisional principle that is called AHANKARA in the old terminology and is the basis of Ego-formation (Ibid). If this divisional principle was not there, we would not have a process of individualization and unique human individuals would not have come in existence. A memory quivered in the heart of Time….